Jesus is in the temple teaching the people. He has sprung every trap laid out against Him and walked away from them triumphant. Now He is going to give a warning about some of those who laid out the traps; the scribes. Mark shared this same warning with us and we discussed it in “Scam of the Scribes.” We looked at the contrast of how the scribes behaved vs how Jesus wants His followers to behave. Matthew doesn’t recount Jesus’ message on this day but Jesus’ teaching earlier in Matthew speak VOLUMES as to how He wants His followers to behave. 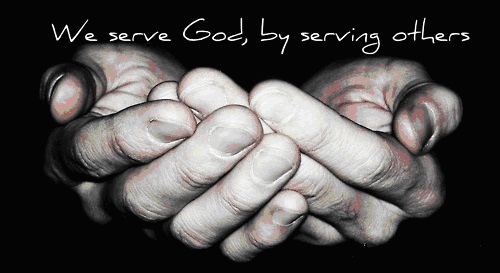 I want to take a hard look at the differences; the overt “service to God” vs the covert service. Jesus tells us NOT to be like the scribes. Not every scribe typified the example Jesus was sharing, but most of them did. They made their “righteousness” known before everyone. Their prayers were long and loud. Their clothes were ornate and flowing. In short, they were as puffed up with pride as a hot air balloon ready for takeoff. Everything they did was meant to be showy. Every act was done to draw attention to how “righteous” they were. But Jesus told His followers to do their goods works in secret. Not to practice their righteousness before men. These instructions were given during Jesus’ sermon on the mountain top. He said to give your alms in secret, help the poor in secret, pray in secret, and fast in secret. The main difference in the behavior is the focus. The focus of the scribes is on themselves. They want to be seen and praised. Any praise they receive stops right there. Jesus’ followers focus is to be on service to God. We are to help others as a gift back to God for all He has given us. Even an act as simple as giving a cup of cold water to one of Jesus’ followers, when done out of love for Jesus, demonstrates our love for Him and our gratitude. Jesus says that there is also a reward attached to both kinds of behavior. The self-serving behavior’s reward is self-evident; the praise of others. The service to others behavior’s reward is notice and kudos from God. I don’t know what those look like all the time, but some of them come in the form of unexpected blessings in the here and now. All of the acts of service carry a blessing to be received in Heaven. Those ones are the MOST valuable of all, even if it is only a special word of appreciation from God. That is worth more to me than all the gold in the world! Father God, help me have a right heart when I serve. Don’t let me serve to gain recognition or praise. Help me remember to turn ALL praise back to You for YOU are the one who is worthy of praise. I am FAR from personally righteous, but am made in right standing with You through Jesus. Never let me forget that.